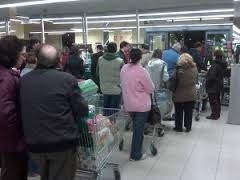 The Spanish, the least endure in queues Study confirms that 36% of Spaniards up a store queue to buy if you find the box. That Spanish consumers are less enduring in queues it is one of the main conclusions of the consultant Coleman Parkes has developed for Epson ; to the point that 36% usually leave a store without buying anything if you have to wait to pay. The study involves analyzing how technology affects when buying in five European countries (UK, France, Spain, Germany and Italy) and places the Spanish clients as the least tolerant when queuing to pay, over the Italians (3rd%), French (25%) and Germans (20%). Respondents consider it important that retailers use new technologies to reduce waiting times and 67% are in favor of reward traders who somehow still shopping in physical stores against those who opt for ecommerce. In addition, 97% believe it is important for a good perception of the brand image that employees use the technologies to give staff and customers value information, to the extent that they believe can be decisive to close or not purchase.